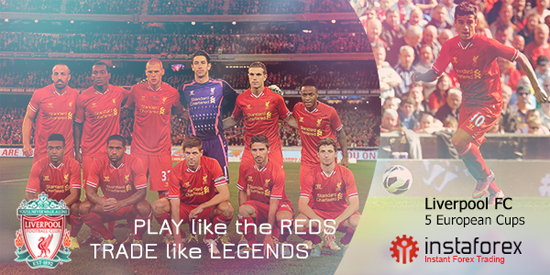 InstaForex, and legendary Liverpool Football Club announced a two-year partnership that will run until the end of the 2015/16 season. 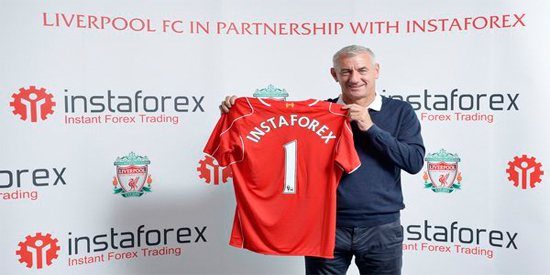 "We are delighted to welcome InstaForex to the Liverpool family as our very first online Forex trading partner. The online service has over 1.2 million online customers and those in Asia and CIS will benefit from this partnership, which will see InstaForex offering fans content and access to the team they love" commented Chief Commercial Officer of Liverpool FC, Billy Hogan. Commenting on the new partnership, Pavel Shkapenko, Director of Business Development at InstaForex said: "InstaForex has similar aspirations to Liverpool - we strive to be the best in the Forex industry as LFC in football. This partnership brings together our young dynamic brand with that of over a century of tradition and we're excited to work with such an established and followed Club." Liverpool FC legend Ian Rush holds Instaforex T-Shirt announcing 2 year partnership between InstaForex and LFC.